The character of Ludwig Von Drake hosted many informative and entertaining episodes of Walt Disney's "Wonderful World Of Color." Here is the opening title, along with the first three re-created pan backgrounds, rich with imaginative detail. Layout and backgrounds are credited to Dale Barnhart. Hey Rob! Wow it's so funny that you just posted these backgrounds because I just watched the Symposium on Popular Songs the other day. In fact I watched it twice I love it so much! Thank you so much for the kind words about my post on Saludos Amigos and Three Caballeros! I'd like to give your page some recognition on my blog for this great post if you don't mind. 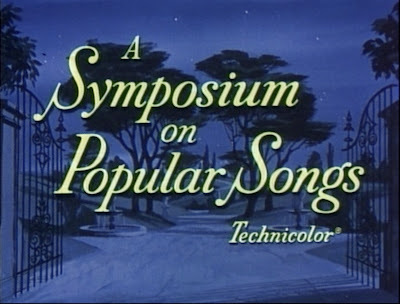 In my opinion the Symposium has some of the best examples of Xerox animation of all. Thank you for not forgetting about this great cartoon. I hope you've recovered and are doing well! I'd almost forgotten about Ludwig Von Drake. Glad to see someone won't let me forget. The last picture in particular really has the same style as 101 Dalmatians. I love it. Thanks for your kind words. I am recovering, slowly, but ahead of schedule so that's good! Michael, Ludwig was (and is) a great character, created especially for Disney TV. I remember many Sunday nights as a VERY small child when he visited our home! What a trip down memory lane!!! My Dad< Dale Barnhart and the other incredible artists- many of whom I knew while growing up- Claimed that Disney Studio was the best job on the planet for a commercial artist. Thanks for sharing this amazing art with the world. It is, of course, very nostalgic for me. Keep it going! virtual voyage:Thanks for the great lines ! I am sharing this with our team because we are about to embark on an project that uses animation. We’re all very excited about it. I especially appreciate your words of caution which have mirrored my own as our team brainstorms. I love the notion of using animation,.Excellent information on you.